As we’ve discussed in earlier blog posts, the baby boomer generation is getting even closer to retirement, and within the next 10 years, millions of trade jobs are expected to be left vacant. As more jobs open up, it is important for our economy to find a means to replace this labor. The solution comes with promoting young workers such as young women and millennials to pursue manufacturing and trades as a viable career option. Trade school tends to be much less expensive than traditional colleges or universities. Many offer additional classes to allow students to get their associate’s degree through a local community college. In an article from NPR, Haley Hughes’ apprenticeship subsidizes the cost of an associate’s degree for those involved in their program. Hughes takes classes at a local community college to earn a two-year degree for around $1,200 a semester. This pales in comparison to the average student debt of the millennial generation, of around $27,000 in 2012 and is climbing at a steady rate. People will often hear that the unemployment rate for Americans with a high school diploma as their highest level of education is nearly twice as high as those with a four-year college degree or higher, and will be deterred from attending other schooling options such as trade school. While this statistic is true, it accounts for all workers fitting in this demographic. This includes those who work minimum wage and part-time jobs. For highly skilled workers in trades such as welders, carpenters, electricians, etc. the rate of pay is actually higher on average than college graduates. This number is only going to grow as the demand for these jobs increases. As the baby boomer generation retires, the US will be in need of many carpenters, welders, utility workers, and more. There are about 600,000 electrician jobs in the United States, and about half of those will go vacant in the next 10 years. There is a huge opportunity for the millennial generation to pursue a high-paying job and avoid student debt. When discussing this issue, the concept of a skills gap is often brought up. This means those entering the workforce today do not have the same knowledge of the trade that retiring workers do. Logically, this makes sense. Those in an entry-level position lack the experience of someone doing a similar job for 20 or more years. This issue with this particular gap is that there are more skilled workers leaving the field than there are entering, resulting in an overall loss of talent. In order to combat this, there needs to be a shift in focus to those choosing to work in trades. In other traditional jobs such as medicine or law, there is an emphasis on a continued education. As technology or laws change, so does standard protocol. There needs to be an emphasis on on-the-job training in the manufacturing industry, particularly at lower level positions. By investing in the continued training of your employees, you are building employee loyalty. This investment in training forms a two-way loyalty between the employer and employee. If employees feel valued by their employer they will be loyal to them. As a company, providing additional training to your workers shows commitment through the time and resources spent on continued training. There are simple ways that to get involved with the resurgence of vocational schooling. Local high schools can invest in vocational training, 0r bring in outside professionals to showcase what they do each day. Schools that offer vocational programs for students are more likely to have students who enter trade-related fields. Utilizing career and technical education centers offered at many high schools will provide more students with the opportunity to pursue vocational careers. Local businesses can participate, too. Each year at North American Signs, Inc. we invite children from neighboring schools to learn about what we do on National Manufacturing Day. Students take a field trip to explore our manufacturing facility. While at NAS, they learn about different forms of signage, as well as the many positions we offer. If we want to promote trades as a great career option, we need to teach this from a young age. Our society encourages those who excel in academics that college is the way to be successful. However, these analytical thinkers may find success in the trades as well. By making these career options throughout a child’s early education, more children might take interest in pursuing trade school. 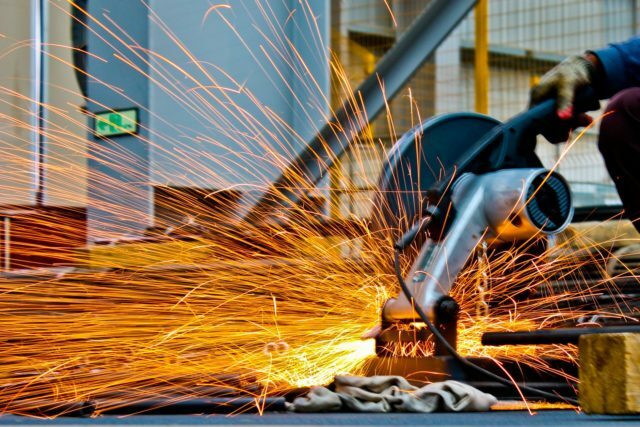 Encouraging more students to pursue trade-related career paths can help close the skills gap and reduce the burden left by those retiring from the manufacturing industry. This article was posted in Manufacturing and tagged manufacturing, millennials, signage, trade schools. Bookmark the permalink. Follow comments with the RSS feed for this post.Post a Comment or leave a trackback: Trackback URL. ← Untapped Potential: Why Aren’t Millennials Working in Manufacturing?